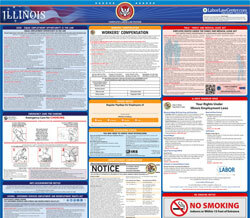 The Day and Temporary Labor Service Act is a general labor law poster poster by the Illinois Department Of Labor. This poster is mandatory for some employers, including day and temporary labor service agencies. This poster must be posted in a conspicuous place where all labor service employees will see it. This poster describes what day and temporary labor agencies must do to register with the state, required notices that employers must give to employees, how wages and wage deductions are dealt with respect to the law, requirements of employers with regards to recordkeeping, and employee transportation law. This poster also discusses placement fee restrictions, laws protecting workers from employer retaliation and how to report violations and make complaints. It appears you don't have a PDF plugin for this browser. Please see the link below to download illinois-dlpostere.pdf. period; and all deductions made for meals, equipment, income tax and social security withholdings and any other deductions. contains the date, worker’s name, work location and hours worked that day. shall be paid for two hours of pay at the agreed upon rate of pay (in addition to the pay for hours worked during that shift). agencies may not charge workers for cashing paychecks issued by their agency. appropriate law enforcement or regulatory agencies. and temporary labor agencies may charge limited placement fees to third party clients who offer employment to day laborers. person aggrieved by any violation of this Act may file suit in Illinois circuit court.